Low back pain is characterized by sensations of pain and discomfort that arise in the lower back, specifically in the area just below the costal margin and above the inferior gluteal folds. 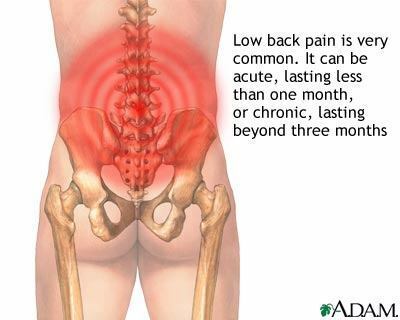 Low back pain can sometimes include pain that radiates into the leg. Lower Back Pain? Watch This! Herniated disc: A condition characterized by damaged intervertebral discs, causing them to bulge or break. 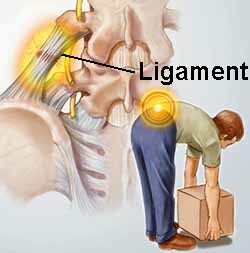 This is more common in aging individuals and is a frequent cause of low back pain. Osteoarthritis: A chronic condition associated with cartilage damage. This damage can be the result of wear and tear across a number of years or as the result of a specific injury. If the cartilage sustains enough damage, there is a high risk of bone rubbing directly onto bone. Spondylolisthesis: A condition occurring when the vertebra becomes dislocated and “slips” over another. It is often referred to under nonspecific low back pain, because a large portion of patients with this anatomical deformity do not present with any related symptoms, including pain. Prevalence rates of this condition within the general population are around 5%. Fractured vertebrae: Damaged vertebrae typically caused by extreme force. Spinal deformities: These are genetically linked problems that relate to the curvature of the spine (e.g., scoliosis or kyphosis), and generally involve the entire spine. These difficulties are relatively uncommon. Recent prevalence rates are not available; however, estimates suggest that spinal deformities occur in about 0.8% to 1.9% of the general population. Compression fractures: There is a higher prevalence of this among post-menopausal women with osteoporosis and in those who have had long-term corticosteroid use. One study, examining 7,000 women over the age of 65, found that 5% had sustained a compression fracture of a vertebra over the course of a four-year period. Previous evidence suggests that approximately 4% of adults seen in primary care settings can attribute their symptoms of low back pain to a compression fracture. Infections within the spine: In some instances, cases of low back pain can be attributable to a disease that has infected the spine. Spinal infection should always be considered in cases of low back pain in conjunction with high fever or if the patient has recently undergone surgery, has a compromised immune system, or is a regular drug user. There are a number of factors that place an individual at increased risk for developing persistent difficulties with low back pain. These factors include gender, perception of pain, depression, anxiety, and employment status. A recently conducted five year prospective study examined prognostic factors that predict long-term outcome in patients reporting low back pain. This study indicated that the patient’s degree of pain intensity and their beliefs regarding the persistent nature of the pain predicted a poor outcome both at a six-month follow-up and a five-year follow-up. Pharmacotherapy is one of the most common treatments prescribed for low back pain. An early study examining the treatment of patients with low back pain within primary care settings reported that 69% of patients were given a prescription for non-steroidal anti-inflammatory drugs, 35% for muscle relaxants, 12% for narcotics, and 4% for acetaminophen. Non-steroidal anti-inflammatory drugs (NSAIDs), including ibuprofen and naproxen, are thought to be so widely utilized owing to their ability to reduce inflammation and thereby reduce associated symptoms of pain. 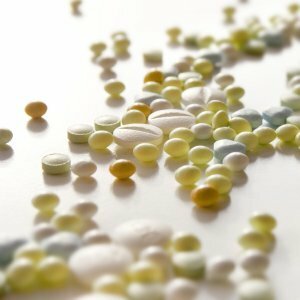 While NSAIDs are widely available over-the-counter, they are associated with some side effects, including gastrointestinal irritation, ulcers, and bleeding. It is generally recommended that NSAIDs be taken for the temporary relief of low back pain and are not recommended in cases of chronic pain, due to the risk of side effects. Anti-depressants have commonly been used in the treatment of low back pain and have received some empirical attention as well. The most frequently studied class of anti-depressants are tricyclics, such as doxepin, clomipramine, or amitriptyline. Though the complete picture as to why anti-depressants have analgesic properties is not well understood, these drugs are believed to provide relief from low back pain by blocking the reuptake of the neurotransmitters norepinephrine and serotonin within the neuronal synapse. Two new classes of anti-depressants that are being prescribed for the treatment of low back pain are selective serotonin reuptake inhibitors (SSRIs), such as citalopram, fluvoxamine, and fluoxetine; and serotonin and norepinephrine reuptake inhibitors (SNRIs), such as duloxetine, venlafaxine, and desvenlafaxine. These drugs are sometimes preferred by physicians owing to their favorable side-effect profile, having fewer side effects than that of the tricyclics; however, their actual mechanisms of action are not understood. SSRIs and SNRIs have received some attention for their particular effect in reducing pain in patients with chronic low back pain. It is not clear, however, whether these pain-relieving benefits are unrelated to the anti-depressant effects of the medication. It is likely that patients who have suffered for significant portions of time with chronic low back pain also develop accompanying feelings of hopelessness, withdrawal, and depression, all of which are relieved along with the symptoms of pain when prescribing SSRIs or SNRIs. Another medication commonly prescribed for the management of low back pain is muscle relaxants. These medications can be divided up further into two classes: antispasmodic and antispasticity. Antispasmodic medications, which include benzodiazepines and non-benzodiazepines, act to reduce muscle spasms that frequently occur in low back conditions. Antispasticity mediciations, which include dantrolene and baclofen, act to reduce the spasticity of the muscle. These medications have received some empirical support for the temporary relief of low back pain. Some anticonvulsants, such as gabapentin, are often used in alleviating low back pain, particularly pain that is neuropathic in nature. Though the mechanisms of action are generally unclear, it is believed that these medications increase the ratio of gamma-aminobutyric acid (GABA) to glutamate. Further, it may be that their effects on the ion-channel or the enhancement of nonsynaptic GABA also accounts for this drug’s pain-relieving qualities. Capsaicin skin patches are believed to provide some relief for low back pain, particularly pain that is neuropathic in nature. Derived from chile peppers, capsaicin binds itself to the nociceptors in the skin, which excites the neurons. Initially, this causes a period of increased sensory sensitivity to itching, pricking, or burning, which is followed by a refractory period of reduced sensory sensitivity. Following repeated applications, the patient can achieve persistent desensitization in the affected area. Evidence has provided strong support for the effectiveness of capsicum over placebo in control trials. Individuals whose low back pain is severe, debilitating, and has not responded to other remedies may wish to speak to their doctor about a trial of opioid medication, such as tramadol, codeine, morphine, or oxycodone, to help manage the pain. These drugs are particularly helpful in cases of chronic, non-specific low back pain. Their pain-relieving effects arise by binding to the opioid receptors within the brain. Studies have provided ample support for the use of opioids in the short-term relief of sudden onset, severe pain. Side effects of these medications after prolonged use include constipation, dizziness, sweating, and sexual impotence; however, these symptoms tend to fade over time. Concerns regarding the possibility of misuse and abuse of this medication suggest that long-term use of opioids to manage low back pain is contraindicated. In terms of pain resulting from problems with the bony structures comprising the spine, there are several treatment options available. 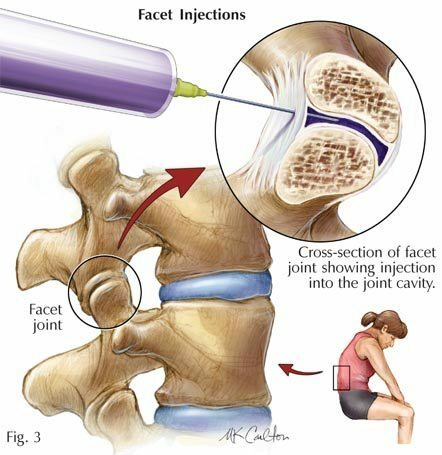 One of these available treatments is the facet joint injection, which is a nerve root block procedure conducted at the facet joint. More specifically, for individuals suffering from chronic low back pain originating within the facet joint, a lumbar facet joint nerve block has been suggested as the most effective treatment for the pain. This procedure is also commonly used as a diagnostic tool in providing assistance with determining the source of pain. Other joint injections are available and have been shown to provide patients with relief, such as sacroiliac joint injections. In contrast to the facet joint, these injections are administered within the sacroiliac joint located at the base of the spine. Finally, for low back pain conditions resulting from irritation or damage to the spinal ligaments and muscles, trigger point injections have been shown to be highly successful in relieving pain. These injections are delivered straight to the trigger and are expected to provide relief from pain almost immediately. For patients with chronic low back pain as the result of a fractured vertebra, vertebroplasty may be particularly beneficial in providing pain relief. This procedure is minimally invasive and can be conducted in an outpatient setting. It involves injecting medical grade acrylic cement to the site of the fractured vertebra. This cement dries quickly and provides pain relief to the patient by creating a support structure within the vertebra, eliminating compression caused by the fracture. While this procedure is relatively new, it has been shown to be highly effective in relieving low back pain. Some patients suffer from low back pain as the result of back surgery. In these cases, pain in the lower back is caused by scar tissue that develops around the spinal nerves of the epidural space following surgery. For these patients, lysis of adhesions is recommended to provide relief from low back pain. During a lysis of adhesion procedure, the physician uses a catheter to inject a chemical compound that breaks up the scar tissue at a molecular level. This procedure is most often conducted for individuals with low back pain following back surgery. Additionally, a recent clinical trial evaluating the procedure indicated that it provides beneficial results. In terms of pain in the lower back that originates due to a damaged disc, facet joint injections may also be employed, along with epidural steroid injections and lysis of adhesions. These procedures have received support for their effectiveness in providing relief from low back pain owing to a damaged disc. Transcutaneous electrical nerve stimulation (TENS) is another non-invasive alternative therapy for managing low back pain. The TENS technique delivers electrical impulses to peripheral nerves by way of electrodes on the surface of the skin. Some evidence has emerged supporting the use of TENS as a viable therapeutic option for providing pain relief to patients with low back pain; however, this data is limited and more studies are warranted examining the effectiveness of the TENS unit above and beyond placebo controls in reducing low back pain. While the use of TENS may not be widely supported as a stand-alone treatment for managing pain, there is evidence of its usefulness and effectiveness when used in conjunction with other therapies that aim to reduce the degree of disability in patients with low back pain. Botox injections are another form of alternative treatment for managing the symptoms associated with low back pain. Botox, or purified botulinum neurotoxins, are toxic enzymes produced by the Clostridium botulinum bacteria that have paralytic effects on musculature. Botox is believed to alleviate low back pain by blocking overactive nerve impulses and inhibiting the release of the neurotransmitters that are involved in sensing pain. Several randomized, controlled trials have been conducted on the effectiveness of Botox injections. Findings suggested that pain reduction was achieved at three weeks and, at eight weeks, ongoing improvements in low back pain were reported and patients demonstrated overall improved function when compared to placebo controls. For patients with third lumbar transverse process syndrome, evidence has supported the effectiveness of Botox injections above the traditional acupuncture techniques that have been around for centuries. Additionally, patients experiencing mechanical low back pain owing to bilateral myofascial pain syndrome also have reported significant reductions in pain following Botox injections. Though rare, some cases of low back pain do not respond to either oral pain medications or direct injections into the spinal nerve. In these instances, alternative methods for pain management are warranted. One such alternative, spinal cord simulation, may provide effective pain relief for patients with treatment resistant low back pain as the result of conditions such as neuropathy or failed back surgery. This intervention involves implanting a medical device near the spine that is designed to deliver electrical impulses that block pain. Typically, these devices include a hand-held controller that sends these pain-blocking impulses as needed. Operating in a similar fashion, intrathecal pump implants are also considered in cases of severe, chronic, and treatment resistant low back pain. This treatment technique involves implanting a device that, rather than delivering pain-blocking electrical impulses, delivers pain medication directly to the spinal cord. Intrathecal pump implants are particularly effective in relieving low back pain as they deliver medication that reduces pain directly to the intrathecal or subarachnoid space. For cases of low back pain that are characterized by low impairment and accompanying disability, it is generally recommended that patients attempt non-invasive, conservative interventions first. For instance, chiropractic treatment provides many patients significant relief from low back pain and has even been implicated in improvements in overall health. This treatment intervention involves manipulating the spine by way of either a high velocity thrust to a joint beyond its restricted range of motion or low velocity movements that occur within or at the range of motion of the joint. There are a number of risks and side effects involved in this procedure, including complications related to cervical and lumbar manipulation, localized discomfort, headache, fatigue, and even discomfort felt in other areas of the body that were not targets of treatment. Studies report that these side effects tended to emerge the same day of the procedure and were no longer reported after 24 to 48 hours. Some serious side effects, including vertebrobasilar accident, disc herniation, and cauda equine syndrome, have been reported; however, they are extremely rare with incidents reported in only one in every four hundred thousand procedures to one in every two million procedures. Modification to the patient’s physiological response system may also be warranted. It is well known that tension and stress can have deleterious effects on the body’s overall health and ability to cope with disruptions. Biofeedback training has received some support for assisting individuals in managing their symptoms of low back pain, along with the tension and stress that likely accompanies them. This non-invasive, non-pharmacological technique assists patients with recognizing symptoms in order to help them learn skills to control them. During this training, the patient practices altering their internal processes by using the visual representation along with techniques taught to them by trained biofeedback technicians. Additionally, individuals are taught relaxation and coping skills, thereby allowing the patient to gain some control over reducing their own symptoms of low back pain. There are a number of alternative treatment methods available for managing low back pain. For instance, acupuncture may help relieve low back pain by placing very tiny needles (1 cm to no more than 10 cm) in specific regions of the body. Specific needle placement, or acupuncture points, are determined in terms of where the pain is located, as well as other regions of the body that are thought to be contributing to the pain. This form of therapy was developed from ancient Chinese medicine practices and is regarded today as a low-risk alternative treatment for managing low back pain. In general, side effects are limited to soreness and minor bruising or bleeding in the area of needle placement. Further, if electroacupuncture is used, the patient may experience some minor skin irritation within the area of needle placement as well. Some evidence has suggested that acupuncture can improve the circulation of blood and other fluids within the affected tissue, provide reductions in pain, increase muscle strength, and reduce the patient’s recovery time. In fact, the World Health Organization recognized acupuncture as an effective therapy option for pain conditions. Patients with low back pain that is not the result of a blunt trauma or who do not have any active inflammation may also gain some relief from their pain and discomfort through a soft tissue therapeutic method known as active release techniques. Using the thumb or fingers, deep pressure is applied to the soft tissue in the affected area. While this pressure is applied, the patient is instructed to engage in various repetitive movements. This causes the muscles to repeatedly elongate and contract and, over time, is believed to restore the underlying affected soft tissue to a normal texture. In doing so, active release techniques can help reduce the stiffness, inflammation, and pain associated with low back pain. These techniques are also believed to reduce the incidence of tissue scarring, tearing, and abnormal fusion. Low back pain is a common condition affecting the various components of the spinal column and back. Previous prevalence estimates have suggested that as many as 84% of adults are expected to experience difficulty with regard to low back pain over the course of their lifetime. 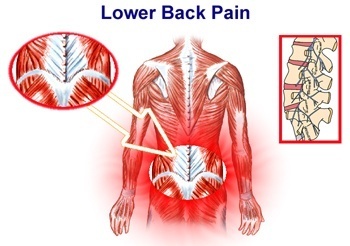 Pain in the low back can be categorized as acute or chronic, and can be caused by a number of different factors, including herniated disk, osteoarthritis, spondylolisthesis, spinal stenosis, fractured vertebrae, congenital spinal deformities, compression fractures, or infections of the spine. Symptoms of pain can be accompanied by cramping, stiffness, muscle spasms, radiating pain, tingling, numbness, weakness, and sensitivity to touch or pressure. There is a large body of research supporting severity of pain and perception of pain as the two most important factors in the prediction of long-term outcomes. While this is beneficial in terms of identifying individuals who are likely at risk for ongoing difficulties, these findings can be used to formulate resiliency-based interventions. For example, physicians could identify individuals who are at risk for chronic issues with low back pain and provide them with an individualized intervention. This plan likely will draw from the empirical data to strengthen that individual’s resiliency resources. Indeed, findings from previous work have suggested that an individual’s perceptions of their pain are in fact malleable. Additional studies are warranted, however, to more clearly delineate the relationship between the patient’s pain perception and severity of the pain in predicting individual outcomes. Accurate assessment of low back pain is essential. This will likely include a brief history, along with a physical examination. If you are exhibiting any symptoms of a more serious underlying condition, it may be recommended that you receive a more thorough evaluation to rule out other conditions, such as a tumor or spinal infection. There are a number of treatment options available for managing low back pain. The treatment options range from conservative treatments, such as oral pain medications (i.e. NSAIDSs) or biofeedback, to interventional treatments, such as facet joint injections or spinal cord stimulation. Patients with chronic low back pain are encouraged to speak with their physician about the possibility of corticosteroid injections to help relieve their symptoms of pain. For patients whose low back pain is unresponsive to the traditional interventions, more aggressive forms of pain management are available and have been shown to be highly effective in managing chronic low back pain. It is recommended that you speak with your physician to determine which treatment option is right for you. At Nevada Pain our goal is to relieve your low back pain and improve function to increase your quality of life. Airaksinen O, Brox JI, Cedraschi C, Hildebrandt J, Klaber-Moffett J, Kovacs F. Chapter 4. European guidelines for the management of chronic nonspecific low back pain. Eur Spine J. 2006;15(2 Suppl):192-300. Birkenmaier C. Should we start treating chronic low back pain with antibiotics rather than with pain medications? Korean J Pain. 2013;26(4):327-335. Borczuk P. An evidence-based approach to the evaluation and treatment of low back pain in the emergency department. Emerg Med Pract. 2013;15(7):1-23. Boswell MV, Trescot AM, Datta S, et al. Interventional techniques: Evidence-based practice guidelines in the management of chronic spinal pain. American Society of I Pain Physicians. Pain Physician. 2007;10(1):7-111. Brosseau L, Milne S, Robinson V, Marchand S, Shea B, Wells G, Tugwell P. Efficacy of the transcutaneous electrical nerve stimulation for the treatment of chronic low back pain: A meta-analysis. Spine. 2002;27(6):596-603. Campbell P, Foster NE, Thomas E, Dunn KM. Prognostic indicators of low back pain in primary care: Five-year prospective study. J Pain. 2013;14(8):873-883. Centers for Disease Control (CDC). Morbidity and Mortality Weekly Report. 2001;50:120-125. Chan S, Hadjistavropoulos T, Carleton RN, Hadjistavropoulos H. Predicting adjustment to chronic pain in older adults. Can J Behav Sci. 2012;44(3):192-199. Colhado O, Moura‐Siqueira H, Faleiros Sousa F, et al. Evaluation of low back pain: Comparative study between psychophysical methods. Pain Medicine. 2013;14(9):1307-1315. Datta S, Manchikanti L, Falco FJ, Calodney AK, Atluri S, Benyamin RM, Buenaventura RM, Cohen SP. Diagnostic utility of selective nerve root blocks in the diagnosis of lumbosacral radicular pain: Systematic review and update of current evidence. Pain Physician. 2013;16(2 Suppl):SE97-124. Hoffman BM, Papas RK, Chatkoff DK, Kerns RD. Meta-analysis of psychological interventions for chronic low back pain. Health Psychology. 2007;26(1):1-9. Homola S. Chiropractic: History and overview of theories and methods. Clin Orthop Relat Res. 2006;444:236-42. Mounce K. Back Pain. Rheumatology. 2002;41:1-5. Smith HS, Colson J, Sehgal N. An update of evaluation of intravenous sedation on diagnostic spinal injection procedures. Pain Physician. 2013;16(2 Suppl):SE217-28. Waseem Z, Boulias C, Gordon A, Ismail F, Sheean G, Furlan AD. Botulinum toxin injections for low-back pain and sciatica. Cochrane Database Syst Rev. 2011;19(1):CD008257. Zhang T, Adatia A, Zarin W, Moitri M, Vijenthira A, Chu R, Thabane L, Kean W. The efficacy of botulinum toxin type A in managing chronic musculoskeletal pain: A systematic review and meta analysis. Inflammopharmacology. 2001;219(1):21-34.